A book review from Mary is like a generous gift. We all know she writes such wonderful book reviews, and I think we really do trust her recommendations. So when Mary reviews your latest book, it quite simply changes your day in a magnificent way! While that’s really difficult to explain in words and without you actually hearing me, I’ll have a go! 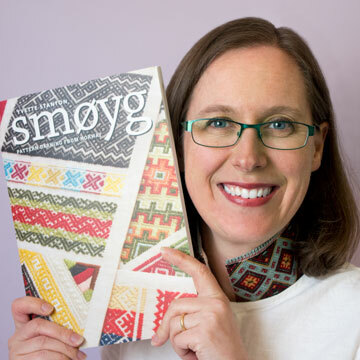 This time last week I was at the Sydney Craft and Quilt Fair launching my new book “Smøyg: Pattern Darning from Norway” which had arrived the day before the show setup. Talk about last minute! This year, I will again be at the Sydney Craft and Quilt Fair. It’s on at the Sydney Exhibition Centre at Darling Harbour from 20th to 24th June. Stand D06: go in the front entrance, turn left and head for Aisle D – Stand D06. Look for the orange flag. Yesterday I opened a very exciting parcel containing the advance copies of Smøyg: Pattern Darning from Norway! I’m really happy with the way the book has turned out. I hope you will love it too. As part of the final stages of preparing Smøyg: Pattern Darning from Norway for publication, I sought and received some pre-publication reviews. I sent PDFs of the book to a number of respected and highly knowledgable needlework enthusiasts for review. Smøyg: Pattern Darning from Norway is now ready to pre-order! I thought you might like to see this image from my upcoming book “Smøyg: Pattern Darning from Norway”, that I posted on the Vetty Creations Facebook page the other day.